Previously on Gotham, Selina said she actually never saw the face of the killer of Bruce Wayne’s parents, Edward continued to be a big creep, there might be a murderous cop on the loose, and HARVEY AND FISH SEEM TO BE LOVERS?! Fish tells Maroni that Oswald is actually working for Falcone. 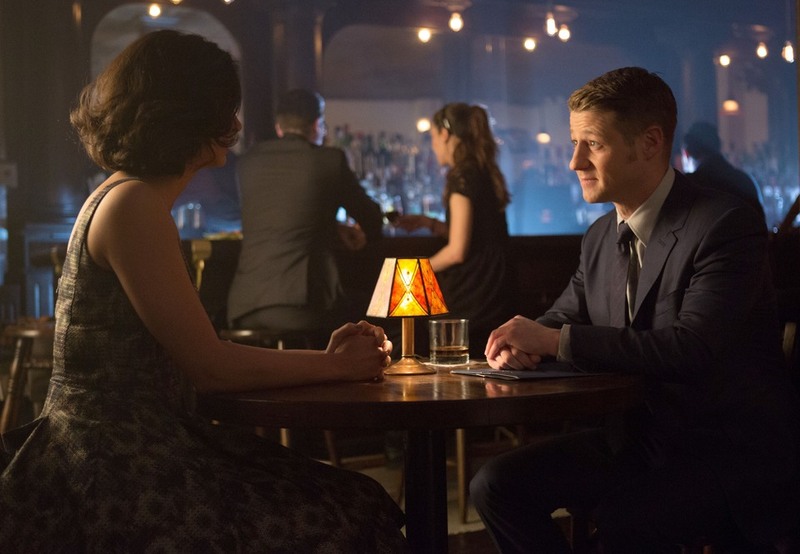 Jim finally catches Selina staying in Barbara’s apartment, and promises to get her to stay in a safer place. She also tells him that she didn’t see the killer’s face. Jim goes to visit Bruce and tells him this, and Bruce says that he believes her. Bruce also points out that Jim promised to find his parents’ killer, but hasn’t done much of anything in way of investigation, and releases him from his promise. Alfred tells Jim to not bother trying to make it up to him, and he’ll look after Bruce as he investigates on his own. Oswald’s alliances continue to be twisty and turny, and I will continue to not keep track of anything related to the mob plots – sorry. Jim goes to dinner with the doctor he met (and flirted with) at Arkham, and they have a cute first date. I like them as a couple quite a bit. Oswald almost gets crushed in a car which is TERRIFYING if, like me, you have a horrid fear of characters getting smushed. He talks himself out, thank goodness. A locker full of human limbs is found, and we meet Dr. Crane for the first time. It’s Dr. Crane, Sr. though – his son is a teen villain like all the rest. I don’t know how canon this is, but dad’s pretty damn creepy. Oswald also runs into a church bus, which is pretty much the greatest thing so far on this show besides the weather balloon killer. It’s revealed that a victim’s adrenal gland is missing. The episode ends on a cliff-hanger – ahhhhh! Watch Gotham Mondays at 8pm EST on FOX. Next week, episode 15: The Scarecrow!